3534, Used Rims, 15X6, 4 LUG, 4-1/4", 04-16, FORD, FOCUS, FIESTA, BLACK STEEL, 14 ROUND HOLES. 3534, Used Rims, 15X6, 4 LUG, 4-1/4", 04-16, FORD, FOCUS, FIESTA, BLACK, STEEL 14 ROUND HOLES. 63725, Used Rims, 13X5, 4LUG, 100 MM, 92-96, HONDA, CIVIC, 14 HOLE STEEL. 63726a, USED RIM, 13X5, 4 LUG, 100MM, 92-94, HONDA , CIVIC, DEL SOL, STEEL, 14 ROUND HOLES. 63727, Used Rims, 14X5, 4 LUG, 100 MM, 92-97, HONDA, CIVIC, BLACK 14 SLOT STEEL. A THRU D INTERCHANGE, DIFFERENCE IS MANUFACTURER. 63827, Used Rims, 14X5-1/2, 4 LUG, 100MM, 01-05, HONDA, CIVIC, 14 HOLE STEEL. 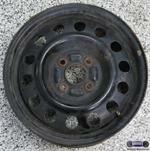 63828, Used Rims, 15X6, 4 LUG, 100MM, 01-05, HONDA, CIVIC, ELEMENT, BLACK STEEL 14 HOLES. 69293, Used Rims, 14x5-1/2, 5 LUG, 4-1/2", 92-00, TOYOTA, CAMRY, BLACK STEEL, 14 HOLES. 69313, Used Rims, 14X5-1/2, 4 LUG, 100MM, 93-02, Toyota, Corolla, 14 HOLES BLACK STEEL. 69313, Used Rims, 14X5-1/2, 4 LUG, 100MM, 93-02, Toyota, Corolla, 14 HOLES STEEL. 7014, Used Rims, 15X6, 5 lug, 00-05, SATURN L SERIES. STEEL 14 HOLES.